On this page you will find the points / end results of all the events for the Dutch Street Power Series Championship and EDRS Championship. We have also an new online ranking system. 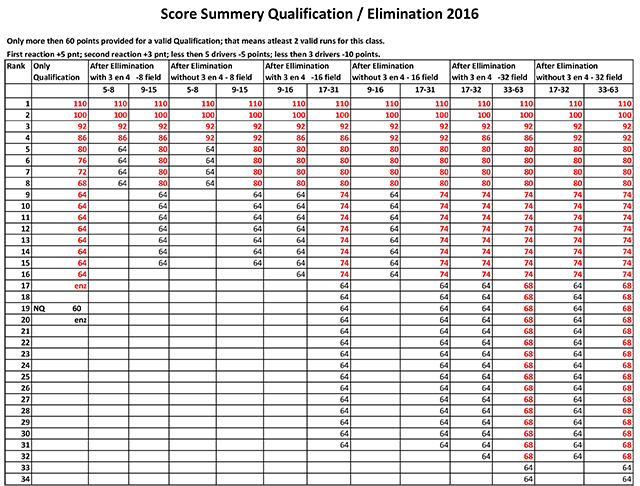 From 2016, the DHRA uses a new adapted scoring. 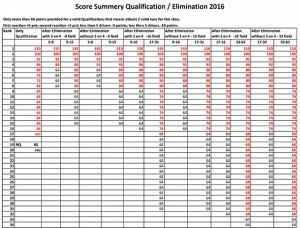 The scoring is already simplified in 2012. We adapt these scoring for 2016. Especially concerning events where we doing Eliminations we applied some changes for a more competitive championship. You can get some more points. Concerning events where we only doing qualifications only adapt some changes to place 2, 3 and 4. Once again this ensures that we can fairly compare each class to determine ‘the overall winner’. For you as drivers there will not change very much. Every driver who is Qualified, that means who has 2 valid runs in his Class, will get a minimum of 64 points. The driver who is not qualified (NQ) in his class will get not more than 60 points (Entry and Technical Inspection). Depending of the number of drivers in that class and the field size we are eliminating, you can get more points during events with Eliminations. When will these changes be implemented ? Starting in 2016 we will use this score counting system for all the events which are in for the EDRS and DSPS championship. In the image below you can see how the new scoring is conducted. Click on it to open the image in a new window with the Original size.